In a large saucepan, heat olive oil over medium-high heat. Add the onion, and garlic and sauté until softened. Add the vermouth and bring to a boil. Reduce heat to low, gently simmer to allow flavor of onion and garlic to impart into sauce. Add cream and allow to simmer gently until slightly thickened. Add half the chopped tarragon to the sauce. Set aside. 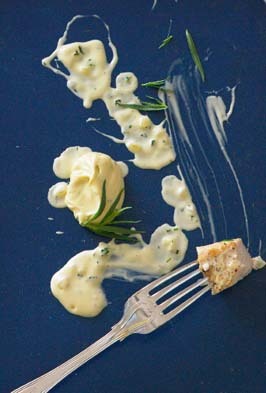 Combine crème fraîche, Dijon mustard, salt and pepper in a small bowl; fold in remaining chopped tarragon. Spoon the hot tarragon cream sauce over chicken, fish or vegetables and top with a small dollop of the tarragon Dijon crème fraîche. Tip: Serve with basmati rice.